The proximal tubule epithelium relies on mitochondrial function for energy, rendering the kidney highly susceptible to ischemic AKI. Dynamin-related protein 1 (DRP1), a mediator of mitochondrial fission, regulates mitochondrial function; however, the cell-specific and temporal role of DRP1 in AKI in vivo is unknown. Using genetic murine models, we found that proximal tubule–specific deletion of Drp1 prevented the renal ischemia-reperfusion–induced kidney injury, inflammation, and programmed cell death observed in wild-type mice and promoted epithelial recovery, which associated with activation of the renoprotective β-hydroxybutyrate signaling pathway. Loss of DRP1 preserved mitochondrial structure and reduced oxidative stress in injured kidneys. Lastly, proximal tubule deletion of DRP1 after ischemia-reperfusion injury attenuated progressive kidney injury and fibrosis. These results implicate DRP1 and mitochondrial dynamics as an important mediator of AKI and progression to fibrosis and suggest that DRP1 may serve as a therapeutic target for AKI. Mitochondrial dysfunction is important in the pathogenesis of AKI4 and has also emerged as an important contributor to CKD.5 Mitochondria are dynamic organelles that have crucial roles in energy production, metabolism, calcium homeostasis, and programmed cell death. The proximal tubule is rich in mitochondria and highly dependent on oxidative phosphorylation for the large demand of ATP necessary for cellular function, notably solute transport.5,6 During renal ischemia, mitochondrial function diminishes,7 and within 15 minutes of reperfusion, ultrastructural analysis reveals fragmented mitochondria.8 Over time, there is organelle swelling and disruption of the tightly packed cristae.9 These morphologic changes coincide with mitochondrial dysfunction and ATP depletion and precipitate cell death pathways. Mitochondrial-derived reactive oxygen species (ROS) can also contribute to oxidative stress during AKI. Emerging evidence has shown that maintaining mitochondrial structural integrity10 and boosting mitochondrial biogenesis11–14 may promote kidney recovery from AKI and prevent fibrosis. Much less is understood about mitochondrial remodeling in progression to CKD. DRP1 is activated in kidney tubule epithelial cells during conditions of ATP depletion in vitro. In response to ATP depletion, DRP1 is dephosphorylated on S63716 and accumulates on mitochondria.8 ATP depletion or exposure to cisplatin, a nephrotoxic agent, results in mitochondrial fragmentation and apoptosis, which can be abrogated by expression of a dominant negative DRP1 or Drp1 (also known as Dnm1l) knockdown. Pretreatment of mice with the putative pharmacologic inhibitor of DRP1, mdivi-1, results in protection against ischemia-reperfusion injury (IRI).8 On the basis of these data, we hypothesized that genetic deletion of Drp1 in the proximal tubule epithelium protects against IRI. Furthermore, we tested the therapeutic potential of Drp1 deletion in the proximal tubule epithelium with a genetically inducible mouse. We showed that genetic deletion of Drp1 specifically in the proximal tubule epithelium before renal IRI protects against kidney injury. Additionally, delayed deletion of proximal tubule Drp1 in the recovery period after IRI resulted in improved kidney recovery and reduced fibrosis. These results indicate that proximal tubule DRP1 increases kidney susceptibility to IRI and contributes to the progression of AKI to fibrosis. The already hypoxic countercurrent exchange properties of the kidney vasa recta render the outer medulla proximal tubule epithelium highly susceptible to IRI.17 A direct reporter of mitochondrial health and oxidative stress in the outer medulla in vivo has not been shown. To address this, we crossed the CAG-CAT-MitoTimer mice (CMV enhancer-β-actin promoter driving LoxP-flanked chloramphenicol acetyltransferase gene with a stop codon before the MitoTimer reporter gene)18 with the proximal tubule–specific PepCKCre+ mouse19 to generate a PepCKCre MitoTimer mouse. The MitoTimer reporter gene has a mitochondrial targeting sequence fused to the Timer fluorescence-based reporter gene,18 which is a modified DsRed mutant that fluoresces green when newly synthesized and irreversibly shifts to red after oxidation (dehydrogenization) of the Tyr-67 residue. In PepCKCre MitoTimer kidneys, MitoTimer fluorescence was only detected in the CD13+ proximal tubule epithelium of the outer medulla (Figure 1A). To determine if proximal tubule mitochondria in the outer medulla become oxidized after IRI, kidneys of PepCKCre MitoTimer mice were subjected to 26 minutes of unilateral ischemia and 3 or 6 hours of reperfusion. The red-to-green ratio of signal intensity significantly increases at 3 and 6 hours of reperfusion compared with the contralateral control kidneys (Figure 1, B and C). Data show that IRI induced mitochondrial oxidative stress in the proximal tubule epithelium in the outer medulla. Outer medulla mitochondria become oxidized after IRI. Kidneys of PepCKCre MitoTimer mice were subjected to 26 minutes of unilateral ischemia and 3 or 6 hours of reperfusion. (A) Representative images of native MitoTimer fluorescence of individual green (left panel; unoxidized) and red (center panel; oxidized) channels and MitoTimer merged with CD13+ proximal tubule immunofluorescence (right panel) in control kidneys. (B) Representative images and (C) quantification of MitoTimer in the unoxidized and oxidized state in mitochondria in proximal tubule cells in the medulla. IRI indicates the kidney exposed to unilateral ischemia-reperfusion (operated kidney). Con, contralateral control (unoperated kidney). Scale bar, 10 μm. *P<0.05; ***P<0.001. Drp1 can be activated and mediates mitochondrial fission in response to oxidative stress and mitochondrial dysfunction.8 The cell-specific role of DRP1 in AKI has not been determined in vivo. To test the hypothesis that DRP1 in the proximal tubule epithelium promotes IRI, proximal tubule–specific Drp1 knockout mice PepCKCre+ Drp1fl/fl (hereafter referred to as Drp1PTKO) and littermate control PepCKCre− Drp1fl/fl (Drp1WT) mice were subjected to 26 minutes of bilateral renal ischemia or sham surgery, and kidney function, tissue injury, and transcript levels were measured after 6 and 24 hours of reperfusion. Drp1 transcript levels were reduced in Drp1PTKO whole-kidney tissue lysate in sham-operated mice and at both 6 and 24 hours of reperfusion compared with Drp1WT levels (Figure 2A). Transcript levels of fission and fusion mediators Mff, Mfn1, and Opa1 were similar across genotype and surgery groups. Mfn2 levels were decreased after IRI in Drp1WT kidneys and similar to sham levels in Drp1PTKO IRI kidneys (Supplemental Figure 1A). An increase (twofold of baseline) in mitochondrial mass was observed in Drp1WT kidneys at 6 hours of reperfusion, with return to baseline levels at 24 hours, but this increase was not found in Drp1PTKO kidneys. Mitochondrial mass in Drp1PTKO kidneys did not change at 6 and 24 hours of reperfusion relative to baseline (at 0 hours) (Supplemental Figure 1B). IRI-induced increases in plasma creatinine (PCr) levels, acute tubular necrosis (ATN), and kidney injury markers, kidney injury molecule 1 (Kim1) and neutrophil gelatinase–associated lipocalin, in Drp1WT mice at 24 hours of reperfusion were attenuated in Drp1PTKO mice (Figure 2, B–E, Supplemental Figure 2). At 6 hours of reperfusion, ATN was reduced in Drp1PTKO compared with Drp1WT kidneys (Figure 2C), and PCr (Figure 2B) and injury markers were not significantly different (Figure 2, D and E). Proximal tubule–specific deletion of Drp1 abrogates IRI. PepCKCre- Drp1fl/fl (Drp1WT) and littermate PepCKCre+ Drp1fl/fl (Drp1PTKO) mice were randomized to bilateral 26 minutes of ischemia or sham operation and euthanized after 6 and 24 hours of reperfusion. (A) Kidney Drp1 relative to Gapdh transcript levels and (B) PCr levels. (C) Stereologic quantification of ATN in the outer medulla expressed as a percentage of total surface area of kidney outer medulla. Kidney (D) Kim1 and (E) neutrophil gelatinase–associated lipocalin (Ngal) relative to Gapdh transcript levels. Kidney (F) Ccl2 and (G) Il6 relative to Gapdh transcript levels. (H) Quantitation of renal neutrophils (CD11b+Ly6G+) by flow cytometry. *P<0.05; **P<0.01; ***P<0.001; ****P<0.001. Inflammation is a key characteristic of AKI.20,21 IRI-induced increases in transcript levels of proinflammatory cytokines chemokine (C-C motif) ligand 2 (Ccl2) and Il6 were similar at 6 hours of reperfusion in Drp1WT and Drp1PTKO kidneys (Figure 2, F and G). Additionally, the numbers of kidney neutrophils at 6 hours were not different (25.75±8.49 versus 19.83±8.04 cells per 1 high-powered field, respectively). Il6 levels and neutrophil numbers were attenuated in Drp1PTKO kidneys at 24 hours of reperfusion (Figure 2, G and H). Altogether, our data provide evidence that DRP1 promotes kidney injury and inflammation at 24 hours of reperfusion after IRI. DRP1 executes mitochondrial fission in response to cellular signals, and IRI-induced mitochondrial fragmentation can occur within 15 minutes of reperfusion. To determine mitochondrial morphology in vivo, kidneys were collected for ultrastructural analysis by electron microscopy after ischemia and 15 minutes of reperfusion or no surgery, and a quantitative assessment of ultrastructural contour analysis was performed on cortical proximal tubule mitochondria. Mitochondria from Drp1WT mice were shorter and rounder after ischemia (Figure 3, A and B, Table 1) compared with no surgery. Mitochondria in Drp1PTKO IRI kidneys were larger but similar in shape compared with no surgery and larger, longer, and less circular compared with Drp1WT IRI kidneys (Figure 3, A and B, Table 1), suggesting that Drp1 deletion in the proximal tubule preserves mitochondrial morphology and prevents IRI-induced fragmentation. Loss of Drp1 in proximal tubules preserves mitochondrial structure, enhances mitochondrial function, and reduces oxidative stress. Drp1WT and littermate Drp1PTKO mice were subjected to bilateral IRI and euthanized after (A and B) 15 minutes or (C–F) 6 and 24 hours of reperfusion. (A) Electron micrographs and (B) quantification of mitochondrial contour measurements. Data are means±SEM of mitochondrial contour measurements from six to eight proximal tubules per mouse from n=3 mice per group. Arrowheads indicate the edge of the proximal tubule on the basolateral side. n, Nucleus. Scale bar, 1 μm. Kidney (C) Nrf2 and (D) Ho1 relative to Gapdh transcript levels and (E) NRF2 protein (100 kD) and β-tubulin (βTub; 55 kD) levels by Western blot from two independent experiments. (F) Oxygen consumption rate (OCR) and quantification of metabolic parameters by Seahorse in primary tubule epithelial cells isolated from kidneys of uninjured mice and cultured for 7 days: (a) oligomycin, (b) carbonyl cyanide-4-(trifluoromethoxy) phenylhydrazone, and (c) rotenone and antimycin A. Data in F are representative of three independent experiments and means of triplicate wells ±SD. (G) Representative images of Mitotracker staining and anti-Tom20 detection and quantification of mitochondrial fragmentation in primary tubule epithelial cells. Scale bar, 10 μM. Con, control (no surgery); s, sham. *P<0.05; **P<0.01; ***P<0.001; ****P<0.001. Mitochondrial dysfunction occurs during IRI and contributes to oxidative stress. Oxidative stress can induce nuclear factor, erythroid derived 2, like 2 (NRF2), a transcription factor that regulates expression of cellular redox balance, mitochondrial proteins, and cytoprotective factors, such as heme oxygenase 1 (HO-1).22 Conversely, HO-1 can activate NRF2.23 Nrf2 and Ho1 transcript levels were increased in Drp1WT kidneys at 6 hours, and although Nrf2 transcript levels decreased at 24 hours (Figure 3C), Ho1 levels remained elevated (Figure 3D). This response was attenuated in Drp1PTKO kidneys. NRF2 protein (95–110 kD)24 levels are similarly elevated in IRI kidneys of Drp1WT and Drp1PTKO relative to respective controls at 24 hours (Figure 3E). Results indicate that the oxidative stress response to IRI is activated in Drp1WT kidneys and to a lesser extent, in Drp1PTKO kidneys. DRP1 mediates mitochondrial fission in response to cellular stress and promotes mitochondrial dysfunction. To assess mitochondrial function, primary tubule epithelial cells were isolated from unoperated Drp1WT and Drp1PTKO mice, and oxidative metabolism was analyzed. Drp1 knockout epithelial cells had increased basal oxygen consumption rate, ATP production maximal respiration, and spare reserve capacity compared with WT cells (Figure 3F). These parameters indicate that the loss of DRP1 enhances mitochondrial function. Consistent with increased mitochondrial function in primary epithelial cells from kidneys of Drp1PTKO mice, there was a decrease in the percentage of cells with mitochondria in a fragmented state compared with control cells (Figure 3G). Mitochondrial dysfunction can contribute to programmed cell death. 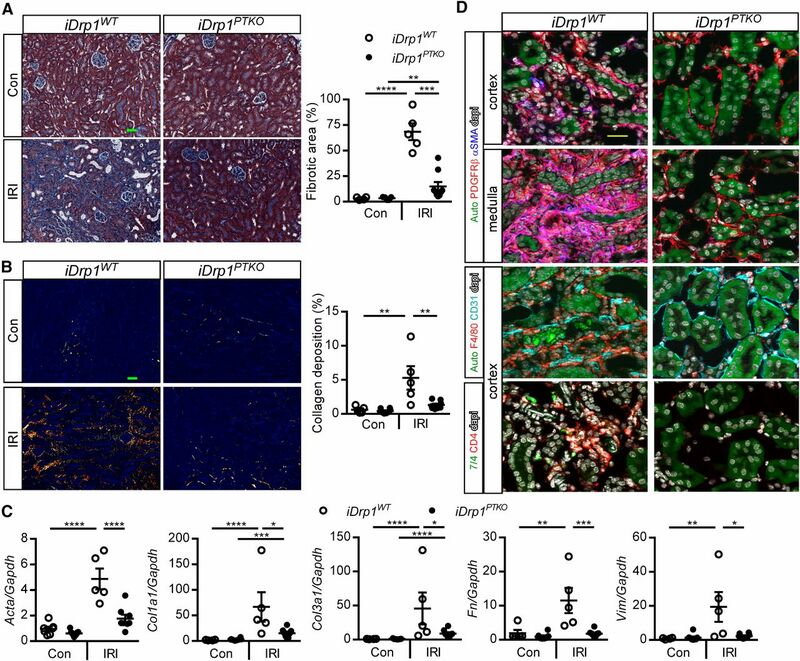 The number of terminal deoxynucleotidyl transferase–mediated digoxigenin-deoxyuridine nick-end labeling–positive (TUNEL+) cells was similar at 6 hours of reperfusion and reduced at 24 hours of reperfusion in IRI kidneys of Drp1PTKO mice compared with control mice (Figure 4). No TUNEL+ cells were observed in sham animals (data not shown). Given these observations (similar TUNEL and injury markers reduced at 24 hours), we hypothesized that Drp1 null tubules may be able to proliferate and recover by 24 hours of reperfusion. As shown in Figure 3, Ki67+ cells were detected in IRI kidneys of Drp1PTKO mice, but very few, if any, were detected in IRI kidneys from Drp1WT mice. 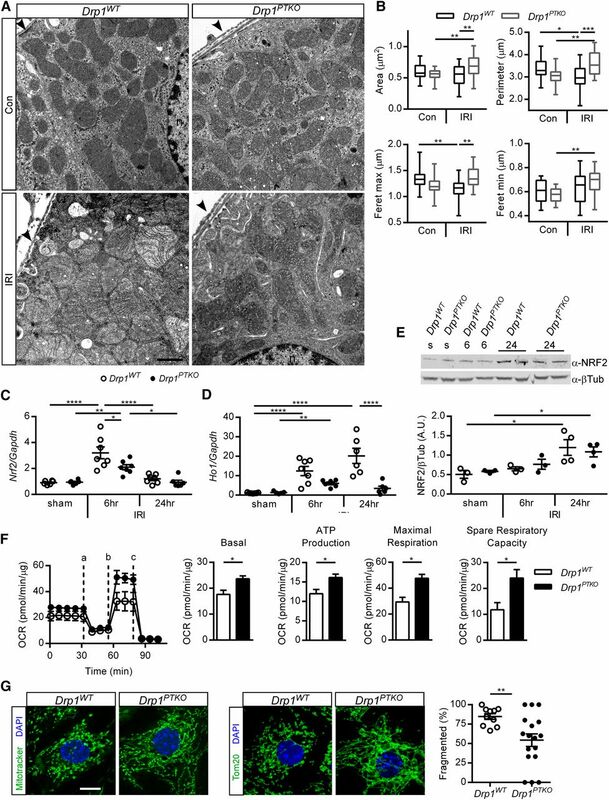 These data provide evidence that deletion of Drp1 attenuates proximal tubule mitochondrial dysfunction and acute tubular necrosis, allowing for cell survival and proliferation in protection against IRI. Proximal tubule Drp1 knockout results in epithelial cell recovery after IRI. Drp1WT and littermate Drp1PTKO mice were subjected to bilateral IRI or sham operation and euthanized after 6 or 24 hours of reperfusion. (A) Representative images of immunofluorescence microscopy at 24 hours. (B) Quantification of TUNEL+ epithelial cells in IRI kidneys at 6 and 24 hours or Ki67+ epithelial cells in sham and IRI kidneys at 24 hours. Auto, green autofluorescence of kidney tissue with intensity adjusted to reveal tubule architecture; hpf, high-powered field. Scale bars, 50 μm. **P<0.01; ***P<0.001. PGC1α, a master regulator of mitochondrial biogenesis, is necessary for renal recovery.12,14 NAD can be produced by PGC1α-driven biosynthesis or from NAM via the nicotinamide phosphoribosyltransferase (NAMPT) salvage pathway. High NAD levels leads to accumulation of the fatty acid breakdown product β-hydroxybutyric acid and production of the renoprotective prostaglandin PGE2. Inhibition of β-hydroxybutyric acid signaling with mepenzolate bromide (MPN) exacerbated kidney injury in mice overexpressing PGC1α.12 PGC1α can induce expression of Sirt3, and SIRT3 can indirectly regulate expression of Pgc1a.25 To determine if this pathway is preserved in Drp1PTKO mice, we first measured transcript levels of Nampt, Pgc1a, and Sirt3. Pgc1a and Sirt3 were downregulated in kidneys of control mice after IRI (Figure 5A) as previously reported26; however, transcript levels in IRI kidneys of Drp1PTKO mice were similar to sham levels (Figure 5A). Transcript levels of Nampt were increased in IRI kidneys of Drp1PTKO mice compared with Drp1WT. To test activation of this protective pathway in Drp1PTKO mice, MPN or vehicle was administered to Drp1WT and Drp1PTKO mice 1 hour before IRI. As shown in Figure 5B, MPN reversed the protective effect observed in Drp1PTKO and not observed in Drp1WT mice subjected to IRI, suggesting that loss of Drp1 enables proximal tubule cells to activate this protective signaling pathway. The renoprotective PGC1α pathway is activated in proximal tubule–specific Drp1 knockout mice. (A) Drp1WT and littermate Drp1PTKO mice were subjected to bilateral IRI or sham operation and euthanized after 24 hours of reperfusion. Kidney Nampt, Sirt3, and Pgc1a relative to Gapdh transcript levels. (B) PCr in Drp1WT and littermate Drp1PTKO mice that received vehicle (Veh; saline) or MPN (10 mg/kg intraperitoneally), an inhibitor of β-hydroxybutyric acid signaling, 1 hour before bilateral IRI and were euthanized after 24 hours of reperfusion. *P<0.05; **P<0.01; ***P<0.001. Delayed deletion of proximal tubule Drp1 or inhibition of DRP1 promotes recovery from IRI. (A) iSLC34a1CreERT2 and iSLC34a1CreERT2 × tdTomato mice were treated with tamoxifen once daily for 5 days (days 1–5) to selectively induce tdTomato expression in S1/S2 segments of proximal tubule and tdTomato native fluorescence in CD13+ tubules on day 7. (B) Tamoxifen (40 mg/kg intraperitoneally) was administered to iSLC34a1CreERT2 Drp1wt/wt (iDrp1WT) and iSLC34a1CreERT2 Drp1fl/fl (iDrp1PTKO) mice beginning on day 3 after unilateral IRI or sham operation to selectively delete Drp1 in proximal tubule. Mice were nephrectomized (unoperated kidney) on day 13 and euthanized on day 14 for determination of PCr and other end points (for C–G). (C) Contralateral control kidney Drp1 relative to Gapdh transcript levels. (D) PCr and (E) stereologic quantification of renal injury in hematoxylin and eosin–stained sections (F) expressed as a percentage of the total surface area of medullary and cortical portions of the kidney section on day 14. Arrowheads indicate examples of tubular obstruction, atrophy, and dilation. Kidney (G) neutrophil gelatinase–associated lipocalin (Ngal), (H) aquaporin 1 (Aqp1) and solute carrier family 12, member 1 (Slc12a1), and (I) Nrf2 and Ho1 relative to Gapdh transcript levels. (J) Vehicle (saline) or mdivi-1 (50 mg/kg intraperitoneally), an inhibitor of DRP1, was administered to WT C57Bl/6 mice beginning on day 3 after unilateral IRI or sham operation; mice were nephrectomized on day 13, and PCr was determined on day 14. IRI indicates kidney exposed to unilateral ischemia-reperfusion (operated kidney). Auto, green autofluorescence of kidney tissue with intensity adjusted to reveal tubule architecture; con, contralateral control (unoperated kidney); Nx, nephrectomy. Scale bars, 50 μm. *P<0.05; **P<0.01; ***P<0.001; ****P<0.001. We next sought to determine if delayed deletion of Drp1 affected progression to fibrosis after kidney injury. IRI kidneys from iDrp1PTKO mice showed decreased fibrotic area as assessed by Masson trichrome staining (Figure 6A) and decreased deposition of large interstitial collagen fibers in the cortex and medulla as assessed by picrosirius red morphometry (Figure 6B) compared with iDrp1WT mice. Transcript levels of fibrosis markers (actin, α2; collagen, type I, α1; collagen, type III, α1; fibronectin 1; and vimentin), were decreased in IRI kidneys from iDrp1PTKO mice compared with iDrp1WT mice (Figure 6C). Collagen, type I, α1 and collagen, type III, α1 levels were increased in IRI relative to contralateral control kidneys in iDrp1PTKO mice, suggesting that there may be activation of a wound-healing response in mice that recovered from IRI. Cellular mechanisms of fibrosis include myofibroblast formation, macrophage accumulation, and peritubular microvascular loss.3,30,31 There was a marked decrease in the density of PDGFRβ+ αSMA+ myofibroblasts in the cortex and medulla of IRI kidneys from iDrp1PTKO mice compared with controls (Figure 6D, Supplemental Figure 3 shows full sized images). There was also decreased density of F4/80+ interstitial macrophages, and peritubular capillaries were preserved in IRI kidneys from iDrp1PTKO mice compared with iDrp1WT mice (Figure 6D). Additionally, there was attenuated inflammation, including neutrophils and CD4+ T cells, in IRI kidneys from iDrp1PTKO mice compared with iDrp1WT mice (Figure 7D). Altogether, our data suggest that proximal tubule DRP1 mediates mitochondrial dysfunction and potentiates maladaptive repair processes after kidney injury leading to fibrosis. Delayed deletion of proximal tubule Drp1 prevents fibrosis after IRI. Kidneys from iDrp1WT and iDrp1PTKO are the same as in Figure 6B. (A) Representative images of kidney cortex and stereologic quantification of Masson trichrome staining in contralateral control (Con) or unilateral IRI-operated (IRI) kidneys expressed as a percentage of the total surface area of the kidney section. Scale bar, 50 μm. (B) Representative images of picrosirius red staining of kidneys using polarized microscopy and quantification of red/yellow birefringence of mature collagen fibers expressed as a percentage of the total surface area of the cortical and medullary portions of the kidney section. Scale bar, 50 μm. (C) Transcript levels of fibrosis markers by quantitative RT-PCR (relative to Gapdh) at day 14. (D) Detection of myofibroblasts (pink) by colocalization of αSMA (blue), PDGFRβ pericytes/fibroblasts (red), CD31+ endothelial cells, F4/80+ macrophages, 7/4+ neutrophils, and CD4+ T cells by immunofluorescence microscopy. Acta2/αSMA, actin, α2, smooth muscle, aorta; Auto, green autofluorescence of kidney tissue with intensity adjusted to reveal tubule architecture; Col1a1, collagen, type I, α1; Col3a1, collagen, type III, α1; Fn, fibronectin; Vim, vimentin. Scale bar, 25 μm. *P<0.05; **P<0.01; ***P<0.001; ****P<0.001. This study provides evidence that DRP1 mediates mitochondrial fission and that, in response to IRI, it mediates dysfunction in proximal tubule cells and promotes IRI-induced cell death and inflammation and reduced kidney function. Furthermore, DRP1 prevents kidney recovery and promotes kidney fibrosis. Mitochondria are dynamic organelles, and their function and morphology are highly coordinated. Prior groups have observed that, within 15 minutes of IRI, mitochondria are fragmented in proximal tubules.7,8 We also selected this early time point to look at direct effects of Drp1 deletion on mitochondrial morphology immediately after ischemia rather than mitochondrial changes at later time points perhaps due to complex downstream responses to ischemia. Our data show that DRP1 mediates this fission event. In mice without surgery, mitochondrial morphology does not appear to be different with the loss of DRP1, indicating that there must be a cellular stress to induce DRP1-mediated mitochondrial morphologic changes. 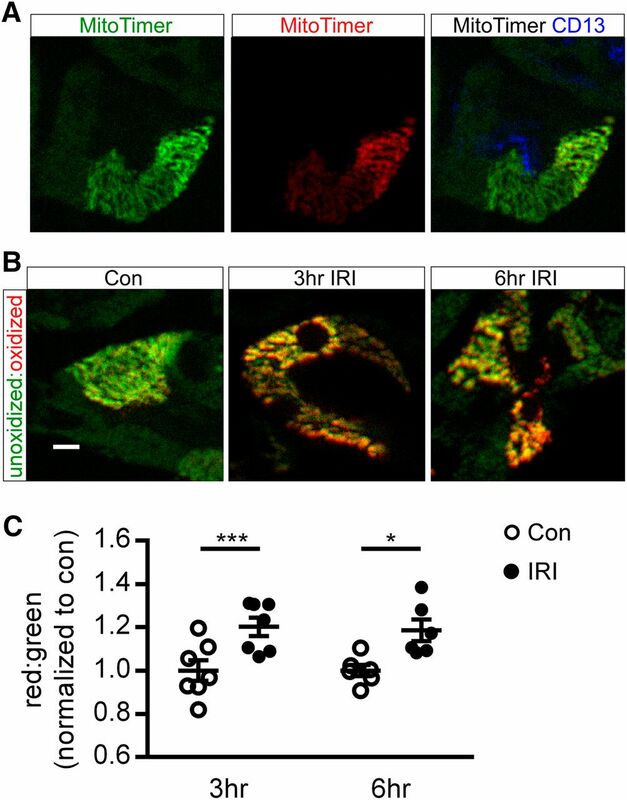 There was no decrease in mitochondrial area in control mice after IRI, likely due to a combination of fission and swelling, which was observed in the representative EM images. Consistent with the hypothesis that DRP1 mediates fission after IRI, the decrease in mitochondrial length (feret maximum) after IRI in Drp1WT mice is attenuated in Drp1PTKO mice. Interestingly, there was an increase in area, perimeter, and width (feret minimum) but no change in overall shape after IRI in Drp1PTKO mitochondria, suggesting that, without fission, there may be a shift toward fusion. Likely, mitochondrial biogenesis is not occurring at this early time point, and we are unable to assess clearance. Mitochondrial dynamics and total mass are the sum of fission, fusion, biogenesis, and mitophagy. In this study, mitochondrial mass was increased in kidneys of control mice at 6 hours, and it was similar to baseline levels at 24 hours of reperfusion, which may be due to increased biogenesis or reduced mitophagy. In kidneys of Drp1PTKO mice, mitochondrial mass was unchanged. 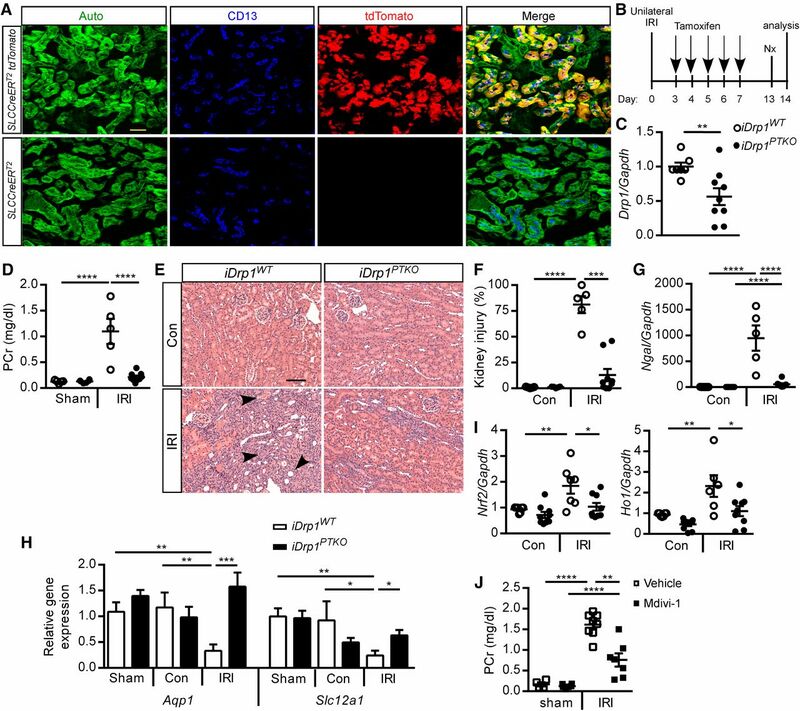 Because IRI kidneys from Drp1PTKO mice also have reduced oxidative stress and mitochondrial swelling, data suggest that, potentially, mitochondrial homeostasis is maintained. DRP1 can contribute to programmed cell death pathways, such as caspase-dependent apoptosis, as well as caspase-independent regulated necrosis.32,33 Here, we observe similar TUNEL+ staining, which is typically a marker of apoptosis but can also be observed in other programmed cell death pathways,33 at 6 hours of reperfusion in Drp1WT and Drp1PTKO kidneys. In contrast, ATN is reduced at 6 hours with the loss of DRP1; thus, loss of Drp1 may be limiting regulated necrosis. Indeed, regulated necrosis has recently emerged as an important pathway in AKI.34 The mechanisms of regulated necrosis and specific pathways are unclear and likely, cell and context dependent. During necroptosis, receptor (TNFRSF)-interacting serine-threonine kinase 1 and 3 is activated and leads to phosphorylation of mixed lineage kinase domain like and phosphoglycerate mutase family member 5 recruitment to mitochondria. Phosphoglycerate mutase family member 5 then recruits and activates DRP1, leading to mitochondrial fragmentation and cell death.35 Various stimuli, including ischemia, can activate DRP1-mediated mitochondrial fragmentation, triggering necrotic cell death.36–38 In this study, there was no increase in Drp1 transcript levels after IRI, and likely, DRP1 is activated by dephosphorylation or other post-translational modifications, as previously shown.16 In other studies, DRP1 was not involved in necroptosis.39 Mitochondrial permeability transition (MPT) pore can be opened by Ca2+ overload and CypD, allowing for a sudden exchange of solutes and contributing to regulated necrosis in IRI.33,34 The precise molecular signaling pathways of MPT-mediated regulated necrosis are unclear in renal proximal tubule cells. Regulated necrosis, unlike apoptosis, releases DAMPs and is proinflammatory, a process termed necroinflammation. Furthermore, inflammation can trigger regulated cell death in an autoamplification loop.34 In our study, renal pathology 6 hours after IRI includes moderate ATN, some innate immune cell infiltration of neutrophils and monocytes, and 100- to 1000-fold expression of Ccl2 and Il6. At 24 hours, ATN and innate inflammation are substantial, and chemokine and cytokine expression has declined. Drp1 deletion resulted in reduced ATN and neutrophil numbers, pointing to its role in reducing necroinflammation. In this study, Ccl2 was similarly elevated at 6 and 24 hours in control and proximal tubule Drp1 knockout. Consistent with the neutrophil data, Il6 was reduced at 24 hours with Drp1 deletion. Altogether, these data suggest that DRP1 and mitochondrial fission do not regulate chemokine expression or that a cell type other than proximal tubules expresses CCL2 and IL6. Determining pathways for proximal tubule cell survival after AKI is key for targeting therapies for renal recovery and prevention of fibrosis. These results provide evidence that, by deleting Drp1 in the proximal tubule, mitochondrial structure and function are preserved, renoprotective NAD biosynthesis is activated, and the tubule epithelium exhibits increased proliferation and reduced programmed cell death. Additionally, Pgc1a, a critical inducer of mitochondrial biogenesis, and Sirt3 expression levels are preserved. SIRT3 is an NAD-dependent deacetylase necessary for maintaining mitochondrial function.25 In the absence of DRP1 and fission, mitochondrial dynamics may tip toward fusion in response to ischemia/ATP depletion and dilute damaged mitochondria, preventing MPT and reducing programmed cell death. In this context, AMPK, a sensor of energy deprivation, may be activated and induce SIRT3 and PGC1α, which induce ROS detoxifying pathways.26,40 Thus, through these cytoprotective pathways, cells may be diverted from a programmed cell death pathway to survival. Although the specific molecular events in kidney epithelial cells that link this pathway to proliferation and regeneration are currently unknown, it may be that, with less programmed cell death, there are more cells to respond to the injury stimulus to proliferate. Thus, in the absence of DRP1, the cell likely has the metabolic capacity to shift from a programmed cell death pathway to a survival and proliferation pathway. The observation of increased proliferation in Drp1PTKO kidneys is an apparent discrepancy with previous findings that the proximal tubule–specific deletion of Mfn2, a mediator of fusion, also increases tubule proliferation 24 hours after IRI.41 However, proximal tubule–specific deletion of Mfn2 did not result in altered apoptosis, necrosis, or inflammation. This suggests that epithelial programmed cell death versus proliferation in response to ischemia is more than a simple tipping the balance of fission and fusion, and it may also depend on protein-protein interactions and cell signaling events. Antioxidant agents and mitochondrial-targeted molecules to reduce mitochondrial dysfunction and oxidative stress have been proposed as a therapeutic strategy in CKD.6 Prevention of podocyte mitochondrial dysfunction through inhibition of DRP1 in a diabetic nephropathy model is protective against kidney disease progression.42 Here, we show that genetic deletion of Drp1 in proximal tubule cells after IRI abrogated kidney dysfunction and injury. Moreover, the genetic model of deletion also showed reduced fibrotic area and hallmarks of fibrosis, including myofibroblast formation, extracellular matrix deposition, inflammation, capillary loss, and oxidative stress. Given these observations, we anticipate that the potential mechanism with the delayed deletion of Drp1 after IRI is similar to acute studies in that, as AKI progresses to CKD, there is increased proximal tubule mitochondrial dysfunction, fission, oxidative stress, and programmed cell death extending from the medulla to the cortex. In the case of delayed deletion of Drp1, mitochondrial fission is inhibited, reducing oxidative stress, tubular atrophy, and fibrosis. Interestingly, the SLCCreERT2 construct does not target the medulla, the area susceptible to IRI. Thus, we attribute protection to the loss of Drp1 in the S1/S2 segments of the cortex. These studies decisively define a role for DRP1 in ischemic kidney injury and recovery. Prior studies using mdivi-1 to study the role of DRP1 may need to be reconsidered given a recent study showing that it inhibits complex I of the electron transport chain.29 Our data suggest that DRP1 may be an important target to promote recovery after IRI and prevent fibrosis. The translational potential for these findings implicates inhibition of DRP1 after an AKI event as an attractive therapeutic target. Experiments were performed in accordance with the National Institutes of Health Guide for Care and Use of Laboratory Animals, and all procedures were approved by the University of Virginia Animal Care and Use Committee. Eight- to 12-week-old 18–20 g male mice on a pure C57BL/6 background (at least ten generations of backcrossing) were used unless otherwise indicated. PepCKCre mice (a gift from V. Haase, Vanderbilt University43; previously described44) were bred to the previously described18 (R.J.W. and Z.Y., unpublished data) CAG-CAT-MitoTimer transgenic mice (a gift from Z.Y., University of Virginia) to produce PepCKCre+ MitoTimer+ mice. PepCKCre mice were also bred to mixed background Drp1f/f mice (H.S., Johns Hopkins University)45 to generate PepCKCre+Drp1f/f and littermate PecpCKCre− Drp1f/f mice. iSLC34a1CreERT2 mice (provided by B. Humphreys, Washington University)27 were bred to (Gt)Rosa26Sor floxed-stop tdTomato reporter mice (Ai9 mice; Jackson Laboratory) or Drp1f/f mice to produce iSLC34a1CreERT2 × tdTomato, iSLC34a1CreERT2 Drp1f/f, and littermate iSLC34a1CreERT2 Drp1wt/wt. C57BL/6 mice were purchased from the NCI Mouse Repository. Mice were maintained in standard vivarium housing with a 12-hour light/dark cycle on a chow diet, and water was freely available. Tamoxifen (T5648; Sigma-Aldrich) was dissolved in 5% EtOH in USP corn oil and administered intraperitoneally to all mice at 40 mg/kg per day as described elsewhere.46 MPN (M5651; Sigma-Aldrich) was dissolved in saline and administered intraperitoneally at 10 mg/kg 1 hour before surgery. Mice were anesthetized with an intraperitoneal injection of a ketamine (120 mg/kg) and xylazine (12 mg/kg) mixture and placed on a warm pad to maintain body temperature at 34.5°C–36°C. Mice were then randomized to sham or IRI operation. Bilateral or unilateral flank incision was performed, and the renal vessels (vein and artery) on either both sides or only the left side were crossclamped for 26 minutes. Sham-operated mice underwent the same procedure, with the exception of vessel clamping. Surgical wounds were closed, and buprenorphine (0.15 mg/kg intraperitoneally) was administered as an analgesic. In unilateral IRI experiments, mice were reanesthetized and subjected to right kidney nephrectomy 24 hours before euthanasia to reveal changes in kidney function of the operated ischemic (left) kidney assessed by measuring PCr. Mice were euthanized by overdose with the ketamine/xylazine mixture and cervical dislocation for confirmation of death. Both the ischemic (IRI) and unoperated (nephrectomized; contralateral control) kidneys were saved for analysis. Blood was collected under anesthesia from the retro-orbital sinus, and PCr (milligrams per deciliter) was determined by using an enzymatic method with minor modifications from the manufacturer’s protocol (twice the volume of sample; Diazyme Laboratories) as previously described.47 Hematoxylin and eosin staining and stereologic analysis were performed as previously described.48 Masson trichrome was performed and analyzed as previously described.49 For picrosirus red staining, kidneys were fixed in 4% paraformaldehyde/0.1 M sodium phosphate buffer (pH 7.4) overnight, changed to 70% ethanol, subsequently embedded in paraffin, and sectioned at 4-μm thickness. Sections were deparaffinized, rehydrated, and stained in picrosirius red solution according to the manufacturer’s protocol (Polysciences). Photomicrographs of picrosirius red birefringence were captured using a Zeiss AxioImager microscope with polarizing filter (Carl Zeiss GmbH) at 200× and Stereo Investigator software (version 9; MBF Bioscience). Quantification of the fibrotic area was done by averaging total red/yellow birefringent pixels of five random fields per kidney section with ImageJ software (http://imagej.nih.gov/ij/). Total RNA was isolated and reversed transcribed to cDNA, and RT-PCR was performed as previously described.49 Primers (Supplemental Table 1) span an exon-exon junction and were designed with Primer-BLAST (NCBI). For mitochondrial mass, genomic DNA was purified from whole-kidney tissue lysates, and the ratio of mitochondrial 16S (For 5′-CCG CAA GGG AAA GAT GAA AGA C-3′, Rev 5′-TCG TTT GGT TTC GGG GTT TC-3′) to nuclear EEF1A1 (For 5′-GGA TTG CCA CAC GGC TCA CAT T-3′, Rev 5′-GGT GGA TAG TCT GAG AAG CTC TC-3′) DNA was determined. Kidney single-cell suspensions were prepared, labeled, and analyzed as previously described.47 Ly6G (2 mg/ml; clone 1A8), CD11b (2 mg/ml; clone M1/70), and CD45 (1 mg/ml; clone 30F11) were purchased from eBioscience. Mice were subjected to 26 minutes of bilateral ischemia, and after 15 minutes of reperfusion, they were reanesthetized for perfusion fixation. Briefly, mice were perfused transcardially with 5 ml heparinized (10 U/ml) saline followed by 20–25 ml freshly prepared 4% paraformaldehyde/2.5% glutaraldehyde in 0.1 M sodium phosphate buffer (pH 7.4). Kidneys were removed, and 1- to 2-mm horizontal slices were postfixed overnight in the same fixative; one section was postfixed in 4% paraformaldehyde without glutaraldehyde and subsequently processed for hematoxylin and eosin staining. The remaining sections were then rinsed three times in 0.1 M phosphate buffer (pH 7.4), and they were prepared for electron microscopy by incubating in 2% osmium (in 0.1 M phosphate buffer [pH 7.4]) for 1 hour, washing and dehydrating through a graded series of ethanol, and embedding in EmBed812 embedding resin (Electron Microscopy Sciences, Fort Washington, PA). Serial ultrathin sections (80–90 nm) of kidney cortex were collected on copper mesh grids and stained with uranyl acetate and Reynolds lead citrate. Two to three grids from each sample were examined using a JEOL 1230 transmission electron microscope, and digital photographs of 8–15 proximal tubules were captured by real-time digital imaging. Primary tubule epithelial cells were isolated from the kidney as previously described.50 Tubule epithelial cells were grown to confluence on Seahorse XF analyzer (Agilent, Santa Clara, CA) 24-well tissue culture plates; oxygen consumption rate was measured, and parameters were calculated as previously described50 with the following modification. Mitochondrial respiration inhibitors were used at the following concentrations: oligomycin (2 μM; Sigma-Aldrich), carbonyl cyanide-4-(trifluoromethoxy) phenylhydrazone (1.5 μM; Sigma-Aldrich), and rotenone (0.1 μM; Sigma-Aldrich) with antimycin A (2 μM; Sigma-Aldrich). Kidney samples were prepared and labeled, and images were acquired and quantified as previously described.47 Goat anti-CD13 A647 (R&D Systems), rabbit anti-Ki67 (clone SP6; Vector Laboratories) or rabbit anti-Tom20 (polyclonal; Santa Cruz Biotechnology) and donkey anti-rabbit Cy3 (Jackson ImmunoResearch Laboratories), rat anti-CD31 A647 (clone MEC13.3; BioLegend), rat anti-F4/80 A555 (clone BM8; Invitrogen), rat antineutrophil FITC or PE (clone 7/4; Cedarlane), rat anti-CD4 A647 (clone GK1.4; Invitrogen), rabbit anti-αSMA Cy3 (clone 1A4; Sigma-Aldrich), and rat anti-PDGFRβ A647 (clone APB; BioLegend) were used at 2 μg/ml for primary antibodies and 1.5 μg/ml for the secondary antibody. TUNEL assay (In Situ Cell Death Detection kit; TMR red; Roche) was performed according to the manufacturer’s instructions. Data are means±SEM of five high-powered fields per kidney section per mouse. For PepCKCre MitoTimer mice, ratiometric analysis was performed as previously described.18 Data are means±SEM of five to eight high-powered fields of the outer medulla per kidney section per mouse. Primary epithelial cells were stained with 100 nM Mitotracker red CMXRos (Invitrogen) for 45 minutes. Cells were then washed and allowed to recover in media; then, they were fixed and mounted with ProLong Gold Antifade with DAPI (Invitrogen). The percentage of cells with fragmented mitochondria was quantified by counting the numbers of cells with fragmented and intermediate morphology per high-powered field from 13 to 15 fields from two independent experiments. Cell lysates were prepared, and Western blotting was performed and analyzed as previously described.50 The following primary antibodies were used: rabbit anti-NRF2 (1:1000; clone EP1808Y; Abcam) and mouse anti–β-tubulin (1:5000; clone 3F3-G2; Santa Cruz Biotechnology). A normality test was used to determine if the data fit a Gaussian distribution. When comparing two normally distributed datasets with equal variance, an unpaired t test was used, or for paired data, a paired t test was used. For data with unequal variance, a t test with a Welch correction was used. For nonparametric data, a Mann–Whitney test was performed. To compare means between normally distributed groups with two independent variables, a two-way ANOVA was used, and a Tukey multiple comparisons post hoc analysis was used to correct for multiple comparisons. If data had unequal variance, a natural log transformation was applied before two-way ANOVA. If data were nonparametric, a Kruskal–Wallis test with a Dunn multiple comparisons test was used to correct for multiple comparisons. Data were analyzed using Prism 6.0b (GraphPad Software Inc.). Results are displayed containing all replicated experiments, and values shown are means±SEM unless otherwise indicated. P values <0.05 were considered statistically significant. M.D.O. served on an advisory board for Mitobridge, Inc.
We thank the University of Virginia Research Histology Core for their assistance in preparation of histology slides. We would also like to thank Dr. Benjamin Humphreys (Washington University) for providing the iSLC34a1CreERT2 mice. Research conducted for this publication was supported by National Institute of Diabetes and Digestive and Kidney Diseases of the National Institutes of Health awards F32DK108563 (to H.M.P. ), T32DK72922 (to H.M.P. ), American Society of Nephrology Ben Lipps Fellowship Program (to H.M.P. ), DK091444 (to A.B. ), DK107941 (to A.B. ), R01 062324 (to M.D.O. ), and R01 085259 (to M.D.O.). The stereology data described here were gathered on an MBF Bioscience and Zeiss microscope system for stereology and tissue morphology funded by National Institutes of Health grant 1S10RR026799-01 (to M.D.O.). Electron micrographs were obtained by using a JEOL Model JEM-1230 Transmission Electron Microscope funded by National Institutes of Health grant 1S10RR021017-01. This article contains supplemental material online at http://jasn.asnjournals.org/lookup/suppl/doi:10.1681/ASN.2017060659/-/DCSupplemental.